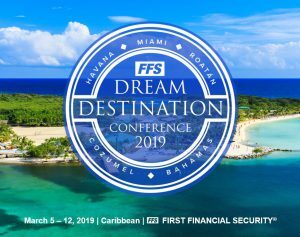 FFS' Incredible Journey Through the Caribbean - Dream Destination Conference 2019 | First Financial Security, Inc.
From the nightlife of Miami to the relaxing shores of the Bahamas, 80 qualified couples explored all the Caribbean had to offer on First Financial Security, Inc.’s Dream Destination Conference 2019 aboard the Regent Seven Seas Voyager. The luxurious ship featured first-class, all-inclusive service complete with spacious balcony suites, fine dining and entertainment for a week in the Caribbean. Elite Trip winners of the Dream Destination Conference 2019 arrived on Saturday, March 2nd, and enjoyed their time at the East, Miami hotel before setting sail with the Main Trip qualifiers. A sumptuous dinner at the Quinto la Huella and a celebratory cocktail reception offered an opportunity for First Financial Security, Inc.’s best and brightest leaders to connect with one another and with corporate leadership. From March 5-12, Main Trip qualifiers explored the Caribbean Sea in style. Once aboard the Voyager, agents enjoyed a beautiful welcome dinner at the Compass Rose. From Miami, the Voyager traveled to Havana, Cuba. There, guests enjoyed mojitos in one of Hemingway’s favorite haunts, elaborate shows and all the history of Cuba’s colorful capital. Whether taking a vintage taxi, sampling Cuban rum and cigars or exploring the Catedral de la Virgen María de la Concepción Inmaculada de La Habana, agents were able to see Cuba at its finest. In Havana, First Financial Security, Inc. was able to give back to the community through our LiSA Initiative. As part of the FFS Gives Back excursion, FFS visited the Angela Landa Primary School and the Nuestra Senora de Belén Convent to understand how Cuba cares for the young and the elderly in their communities. A delicious lunch was held at the Moneda Cubana, whose organization seeks to spur entrepreneurship by teaching culinary skills to teens. The excursion funds benefitted the Moneda Cubana Project. FFS agents convened aboard the Voyager on Thursday, March 7, 2019 to learn news from our carrier partners and home office leaders on how to grow their knowledge of FFS strategies and build their businesses to even higher levels by 2020. Roatán, Honduras was the next stop, featuring beautiful beaches and fantastic snorkeling. Roatán was a relaxing day for most, but some set out on kayaks or took to the tree tops and zip-lined in a 13-jump series. Next on our trip was Cozumel, with waves crashing along rocky outcroppings. Many tasted the delights of Mexico at a Mayan cooking class while others learned of the sacred cacao plant and how it was used as both currency and a drink for the gods in Mayan culture. Cozumel was a shopping destination, with guests bringing home fine jewelry, silver, tequila, and chocolate to remember their travels. Aboard the Voyager, guests enjoyed an exclusive cocktail reception with Captain Stanislas Gerard Jean Mercier De Lacombe, master of the Seven Seas Voyager. Agents dressed to the nines for an evening of divine hors d’oeuvres and unparalleled service by the Voyager crew. In the lounges, agents danced the nights away and enjoyed the onboard entertainment. To conclude the FFS Dream Destination Conference 2019, the Voyager made its final stop at a private island in the Bahamas. The Great Stirrup Cay was a haven for water sports – jet skiing, parasailing, snorkeling and paddle boarding. Snorkelers were delighted to see an underwater sculpture garden spread out beneath the waves. Stumbling upon a mermaid reading to her children and treasure chests alongside the colorful fish and turtles was a treat. Dream Destination Conference 2019 was an incredible journey through the Caribbean and we cannot wait for 2020 in Jamaica. What will you do to make sure you’re with us?